In the promotional material for Smoke Gets in Your Eyes, we are promised “a peek behind the black curtain,” a revelation of “life’s terrifying secret” by a young woman at work burning dead bodies in California—a high priestess, albeit self-appointed, in the “alternative death” community. Spoiler alert: we die. There are no alternatives. 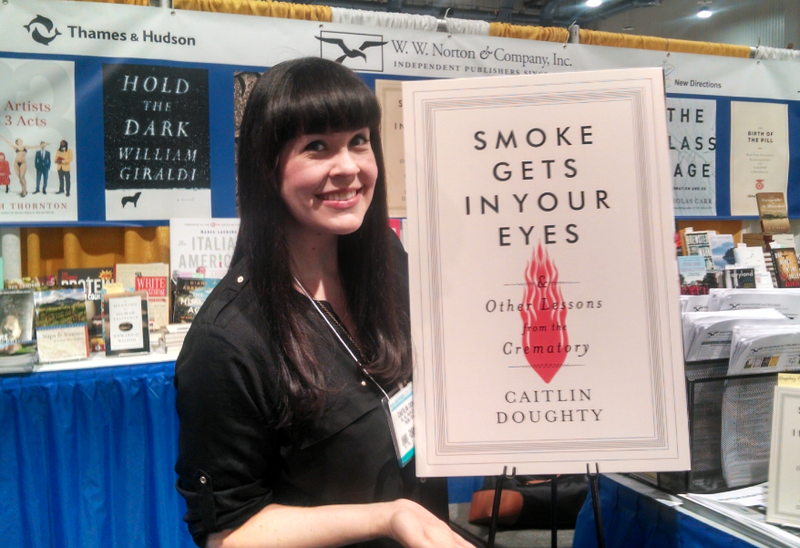 Caitlin Doughty belongs to the selfie generation, so she comes by her fascination with her particulars honestly. To be young and female in a crematory enterprise would be special indeed had it not become the norm some time ago. Once a mostly male endeavor, like the Marine Corps and the Rotary Club, funeral work has been feminized. The exception has become the rule. Her book, if not a must-read, is a really good one; if not an essential text, no less essentially instructive. Doughty has mined a deep vein of reliable witnesses—literary, secular, classic, and collegial—and adds to their best shots at the big questions her own provisional formulations. In particular, for the reverend clergy, sage, and seminarian, this is a book well worth the trouble, not only for the blood-and-guts intrigues of the crematory and embalming theater, but for the glimpse it offers of the anxious and unchurched who do not occupy the pews—congregants of the growing parish of the religiously and ritually adrift—who, if they ever ask eternal questions, likely do so when there’s a corpse at hand. Of course, most of the mainstream clergy rose to [Jesssica] Mitford’s bait [in The American Way of Death] and banished the bodies and the boxes from their churches, along with the fierce urgency of the freshly dead and their grief-stricken kin. What remains, decades later, are bodiless obsequies, ubiquitous and abstract “celebrations of life,” convenient, cost-efficient, easy, and meaningless, which emphasize the good laugh over the good cry, personalities over the promises of faith, and hobbies over the heavy lift. Gone, with the corruptible corpse, are the shoulder and shovel work, the holy witness we owe dead saints and sinners, the heft and heave it takes to go the distance with them. The “sacred community theater,” as Long calls it, has been replaced by a light-duty Kabuki roughly equivalent to Calvary without the crucifixion. Of course, one upshot of banishing the dead from the foot of our altars and sending them on their way alone is that the living have found a way of going it alone religiously as well, each with a custom-made spirituality du jour. If not cafeteria Christianity, then potluck, personalized, do-it-yourself musings and user-friendly hereafters. That’s a bargain compared to belonging, what with its faith claims and commandments, tithes and stipends, sin and sacrifice. Read Thomas Lynch’s entire brilliant review in Christian Century HERE.